In recent years, the number of travelers staying at B&Bs has increased, and thus the demand for sample sized toiletries has also increased. According to an Airbnb analysis from Penn State University, "Airbnb host revenue has increased significantly. The total 14-city sample shows that monthly operator revenue increased from $93.2 million in October of 2014 to $139.0 million in September of 2015, representing a 49% increase." Airbnb represents only one of the online marketplaces, but its statistics indicate a growth potential for handmade cosmetic makers. With each traveler stay, most hosts provide premium cosmetics and the appeal for local handmade toiletries aligns nicely with many bed & breakfast business models. Here are some tips for creating sample-sized toiletries with relatively inexpensive equipment. As your business grows, you may have bed and breakfast owners approach you about wholesale products and will hopefully create a demand for more of your handmade products! With the increase in products, your batch size will likely need to increase. Use a Percentage Calculator to input your recipe quantities, making sure to input in the same unit of measure, for example all in weighted ounces. Once you hit 'calculate', the calculator will give you a breakdown of your recipe as a percentage of each ingredient. Next, take your percentages over to a Batch Calculator. Input your recipe ingredients with corresponding percentages and the batch size you wish to produce. Once you hit 'calculate', the calculator will scale your recipe quantities up or down depending on the batch size. 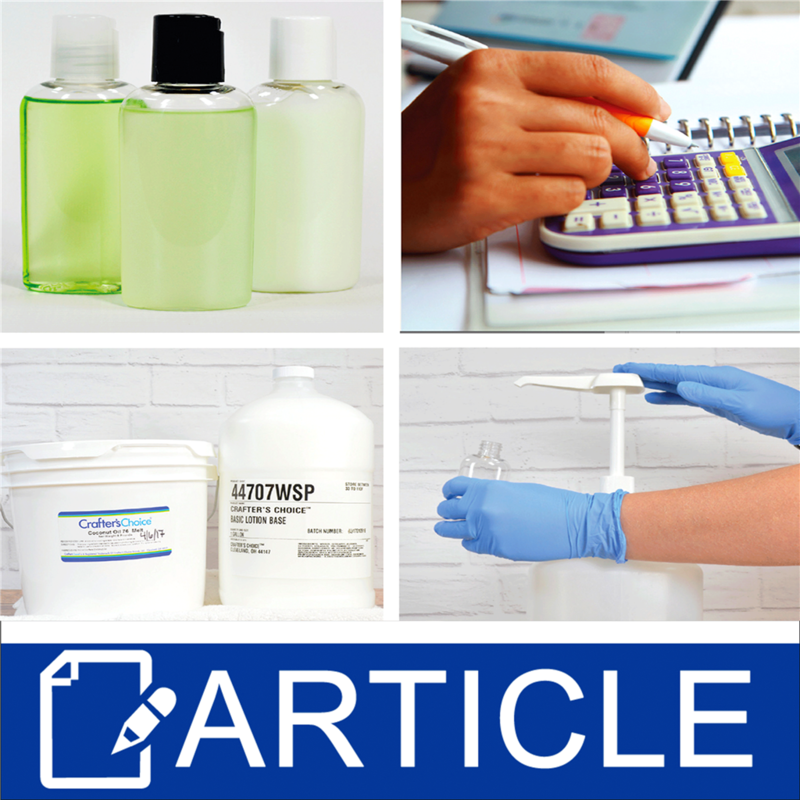 If sizing a CP or HP soap recipe, we recommend running your scaled numbers through a lye calculator as well, to double check your work. Now with your new quantities you can begin making product! Many butters, oils and cosmetic bases come in large buckets or large jugs, and these cleaned out packaging items can be easily up-cycled. Mix soap, body wash, shampoo, hair conditioner or lotion in up-cycled and cleaned out buckets for a larger container than perhaps your normal 64 ounce mixing bowl. Products such as body wash, shampoo, hair conditioner and lotion can also be stored in these same buckets or moved to other large packaging such as 32 ounce bottles or gallon jugs. One of the most tedious tasks with sample-sized toiletries is filling all those tiny bottles! While there are many fancy (and unfortunately usually expensive) machines that can aid in your bottle filling, the simple answer may be right in front of you. As mentioned before, some cosmetic bases and oils come in gallon jugs. These jugs have a standard opening, and a pump fitting that opening is easy to find. Fill up-cycled jugs or new jugs with your finished product. Next twist on your pump. Finally pump out your handmade product into as many sample sized bottles as you need!